Dr. Laska’s expertise is in nutrition and obesity prevention. Over the past decade she has led a multifaceted research portfolio, with particular interests in modifiable and contextual determinants of obesity, dietary patterns, and food environments. Her work has been supported by the National Institutes of Health, U.S. Department of Agriculture, Centers for Disease Control and Prevention and American Heart Association, and she has published more than 120 peer-reviewed manuscripts to date. 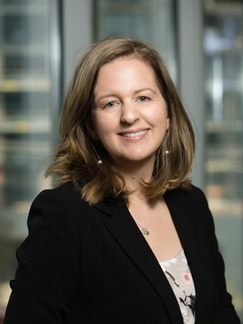 She is currently PI of an NIH R01 investigating local policy impacts on community-level healthy food availability and serves as PI of the University of Minnesota NOPREN (Nutrition and Obesity Policy Research and Evaluation Network) research site. Overall, Dr. Laska’s work has been influential in the field, having been cited more than 5,300 times in journals published in 16 languages from 54 countries. Her published work has been utilized in key recommendations and reports by the National Academy of Sciences, Engineering and Medicine (including the Institute of Medicine), Dietary Guidelines Advisory Committee, American Academy of Pediatrics, Academy of Nutrition and Dietetics, American Public Health Association, Office of the Surgeon General, Centers for Disease Control and Prevention, and Lancet Commission on Adolescent Health and Wellbeing. Laska MN, Schmidt Sindberg L, Ayala GX, D'Angelo H, Horton LA, Ribisl KM, Kharmats A, Olson C, Gittelsohn J. Agreements between small food stores and their suppliers: Perceived profitability and financial incentivization of unhealthy foods and beverages in four urban settings. Food Policy. (In Press). Ayala GX, D'Angelo H, Gittelsohn J, Horton L, Ribisl K, Schmidt Sindberg L, Olson C, Kharmats A, Laska MN. Who is behind the stocking of energy-dense foods and beverages in small stores? : The importance of food and beverage distributors. Public Health Nutrition. (In Press). Bruening M, Argo K, Payne-Sturges DC, Laska MN. The struggle is real: A systematic review of food insecurity on post-secondary campuses. Journal of the Academy of Nutrition and Dietetics. 2017 Jul 26. pii: S2212-2672(17)30551-8. doi: 10.1016/j.jand.2017.05.022. [Epub ahead of print]). PMID: 28754200. Pelletier JE, Schreiber LRN, Laska MN. Minimum stocking requirements for retailers in the special supplemental nutrition program for women, infants, and children: Disparities across US States. American Journal of Public Health. 2017; 107(7):1171-4. PMID: 28520477. Lytle LA, Laska MN, Linde JA, Moe SG, Nanney MS, Hannan PJ, Erickson DJ. Weight-gain reduction among 2-year college students: The CHOICES RCT. American Journal of Preventive Medicine. 2017; 52(2):183-91. PMCID: PMC5253254. Caspi CE, Lenk K, Pelletier JE, Barnes TL, Harnack L, Erickson DJ, Laska MN. Food and beverage purchases in corner stores, gas-marts, pharmacies and dollar stores. Public Health Nutrition. 2017;20(14):2587-2597. doi:10.1017/S1368980016002524. PMCID: PMC5357581. Laska MN, Pelletier JE. Minimum Stocking Levels and Marketing Strategies of Healthful Foods for Small Retail Food Stores. Durham, NC: Healthy Eating Research; 2016. Laska MN, Lytle LA, Nanney MS, Moe SG, Linde JA, Hannan PJ. Results of a 2-year randomized, controlled obesity prevention trial: Effects on diet, activity and sleep behaviors in an at-risk young adult populations. Preventive Medicine. 2016; 89:230-6. PMCID: PMC5038135. Laska MN, Sevcik SM, Moe SG, Petrich CA, Nanney MS, Linde JA, Lytle LA. A 2-year young adult obesity prevention trial in the US: Process evaluation results. Health Promotion International. 2016; 31(4):793-800. PMCID: PMC5141943. VanKim NA, Erickson DJ, Eisenberg ME, Lust K, Rosser BRS, Laska MN. Relationship between weight-related behavioral profiles and health outcomes by sexual orientation and gender. Obesity. 2016; 24(7):1572-81. PMCID: PMC5024549. Laska MN, VanKim NA, Erickson DJ, Lust K, Eisenberg ME, Rosser BRS. Disparities in weight and weight behaviors by sexual orientation in college students. American Journal of Public Health. 2015; 105(1):111-21. PMCID: PMC4265919. Laska MN, Caspi CE, Pelletier JE, Friebur R, Harnack LJ. Lack of healthy food in small-size to mid-size retailers participating in the Supplemental Nutrition Assistance Program, Minneapolis–St. Paul, Minnesota, 2014. Preventing Chronic Disease. 2015; 12:E135. PMCID: PMC4556107. Gittelsohn J, Laska MN, Karpyn A, Klingler K, Ayala GX. Lessons learned from small store programs to increase healthy food access. American Journal of Health Behavior. 2014; 38(2):307-15. PMCID: PMC3960288. Laska MN, Pelletier JE, Larson NI, Story M. Interventions for weight gain prevention during the transition to young adulthood: A review of the literature. Journal of Adolescent Health. 2012; 50(4):324-33. PMCID: PMC3406485. Ayala GX, Laska MN, Zenk SN, Tester J, Rose D, Odoms-Young A, McCoy T, Gittelsohn J, Foster GD, Andreyeva T. Stocking characteristics and perceived increases in sales among small food store managers/owners associated with the introduction of new food products approved by the Special Supplemental Nutrition Program for Women, Infants, and Children. Public Health Nutrition. 2012; 15(9):1771-9. PMID: 22583675. Gittelsohn J, Laska MN, Andreyeva T, Foster G, Rose D, Tester J, Lee SH, Zenk SN, Odoms-Young A, McCoy T, Ayala GX. Small retailer perspectives of the 2009 Women, Infants and Children Program food package changes. American Journal of Health Behavior. 2012; 36(5):655-65. PMCID: PMC4703098. Laska MN, Pasch KE, Lust K, Story M, Ehlinger E. The differential prevalence of obesity and related behaviors in two- vs. four-year colleges. Obesity. 2011; 19(2):453-6. PMCID: PMC3414256. I am the director of the Public Health Nutrition program and teach courses and advise students within the program. Melissa Laska is working with the Minneapolis Health Department to asses the impact of the city's Staple Foods Ordinance, the first piece of legislation in the country to require licensed grocery stores — including corner stores, dollar stores, gas stations, and pharmacies — to display and sell high quality fresh produce and other whole foods. In photo above, Dr. Laska, center, is with student Kirsten Arm and Ousman Camara, left, owner of K's Grocery and Deli. Dr. Laska serves as the Co-Director for the Obesity Prevention Center at the University of Minnesota, which aims to prevent obesity through conducting and disseminating interdisciplinary research, preparing the next generation of researchers, and connecting the community to research on obesity prevention. She also serves as a Senior Research Adviser to Healthy Eating Research (HER), a national program of the Robert Wood Johnson Foundation focusing on policy strategies to promote healthy eating to prevent obesity among children and adolescents. Through this role she has convened and led several national scientific working groups and expert panels of leading scholars across the US who are conducting research on environment and policy change in U.S. communities.